This book was a walk-through of Paul's ministry. A lot of people avoid reading the Bible because it can be confusing. This book is easy to understand and contains many Biblical truths. It is about the letters Paul wrote, but is much easier than reading the actual letters. This book is great for anyone who would like deeper insight into Paul's ministry. The Least of the Apostles was an inspiring read that helped shed light on the message that the New Testament is trying to help people understand. Dennis Ingolfsland describes the writings of the New Testament with the help of written scripture. This book helped me understand the Bible and connect details that I was not familiar with. A read that can be reread and worth the buy. 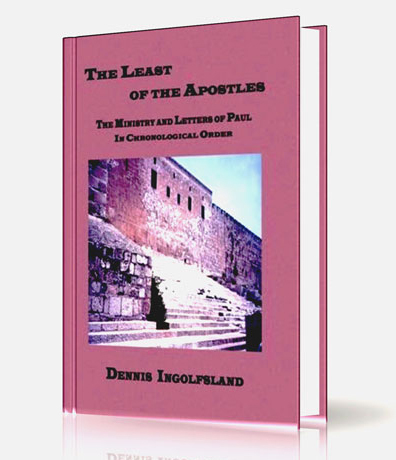 The author has Hit a Homer with the Chronological basis of the Letters of Paul, giving the reader a concise reflection of the Political, Religious, and Cultural situation of the time of Paul and his writings. The "Harsh Letter" to the Corinthians opens up the 2 Books to the Corinthians that reveals a new insight to these letters. Excellent book for the "New" Christian or for an indepth Bible Study. Have recommended this book to many friends and Church Leaders. The ministry and letters of Paul in Chronological Order is exactly what I got! Even more importantly I understood it! With this Book: I was able to see the big picture, I gained a good perspective and handle on Paul's Ministry, and I was able to comprehend all of it. I recommend this to anyone who wants an overall synopsis of Paul's life. It will also help in your understanding of the New Testament.